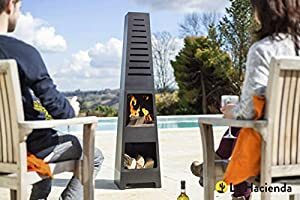 Garden incinerators & Fire Pits are presently presenting the extremeley popular La Hacienda Skyline Black Steel Garden Chiminea With Laser Cut Design 150cm High at a brilliant price. 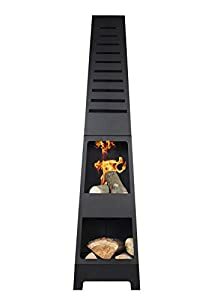 Don't pass it over - purchase the La Hacienda Skyline Black Steel Garden Chiminea With Laser Cut Design 150cm High online today! 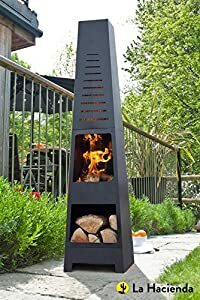 Skyline Steel Chimenea with Log Store The Skyline steel chimenea with log store under has a wonderful minamalist styling and is a brilliant effective way to heat your outdoor space all year round. Using the Skyline is simple- create a fire using logs within the mouth of the chimenea, relax in your favourite chair and soak up the warmth produced whilst being entranced by the dancing real flame. The built in log store underneath keeps your fuel tidy and readily available when needed. Wow your friends with the simple stunning design of the Skyline Made using matt black high temperature powder coated steel, the Skyline is robust and sturdy. Height of 150cm, a width of 36cm and a diameter of 36cm, the Skyline is suitable for any garden, but particularly harmonises with modern and contemporary styled gardens.